I have an old wooden crate that is the perfect size for holding records, but unfortunately with garage sales and whatnot, one crate is no longer enough to hold my record, ahem, "collection". 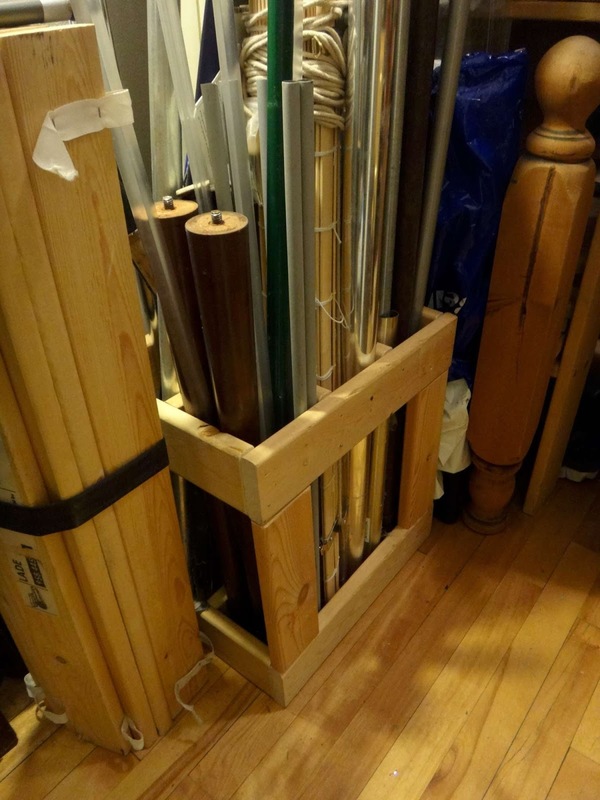 It occurred to me last year that I could make my crate own out of the LADE boards that come from bed slats, and which are so useful for many projects, including the 90-minute glove rack and the long things holder I briefly mentioned in my last post. I took photos during the process and I'm finally getting around to posting about it. It starts with isolating the wooden slats from the cloth straps that are stapled into them to keep them together while in use as a bed. 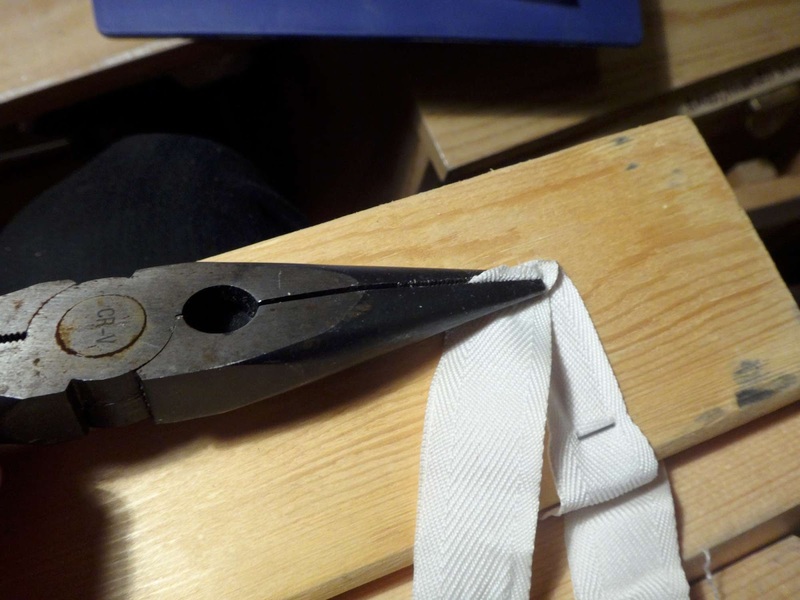 First I separate the cloth from the slat by grabbing it with needle-nose pliers and rotating them. Here's the schematic I drew for myself after figuring out how to get the various pieces I needed from 26" long Lade boards in order to get a crate that is roughly the same dimensions as my antique one, i.e. 17.5" by 9" and tall enough to hold 12" records. Here I'm cutting the pieces with a mini handheld circular saw I bought. 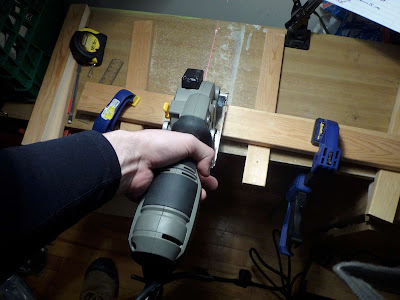 This is the only power tool I've bought (I inherited my drill and not counting the Dremel or heat gun) and though I'm more comfortable using hand tools since that's what I used growing up, being able to cut a board in two seconds with very little effort is very useful. Cutting the boards lengthwise is even harder with a hand saw (and I've done it before for the side pieces on my laptop box). 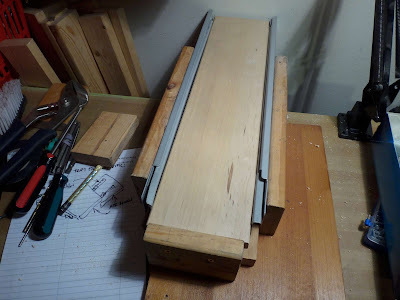 Since the circular saw has a plate that would bump into any clamps I tried to use on the lengthwise cut, I screwed the board onto a longer, sacrificial board from underneath and clamped that one down. The lengthwise-cut pieces form the corner bits that hold everything together. Here I've tied (using the straps pulled off of the Lade boards) the end pieces to the corner bits to mock them up and see how well things will fit together. Another reason I needed to mock it up was to see how I wanted to arrange the slats. In my diagram I had a hole cut out of the end boards, but I realized that I could just omit the second-highest board and the top board naturally becomes a handle. Here I'm lining up the screws in the corner bit to match up with the end pieces (I'm too impatient to bother with glue and still wasn't sure how or if everything might come together). The screw heads will be covered over later by the long side slats. 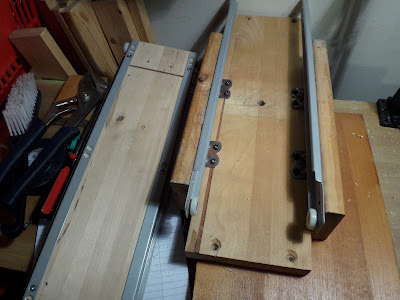 I had already screwed the other end together, and because it's used wood that is slightly warped, I needed to clamp two boards onto this end to make them straight for inserting. 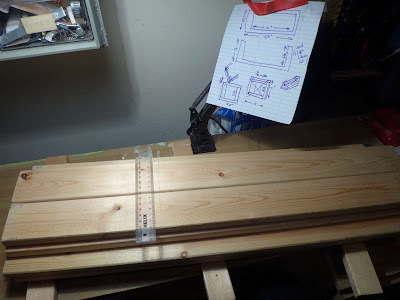 In retrospect, the screws for the lowest end slat should have been higher up in order to allow more room for the ones that will be screwed in from the bottom for the bottom slats. Edit: After posting this blog entry, I discovered a photo of a second crate I had started to build which I had forgotten. 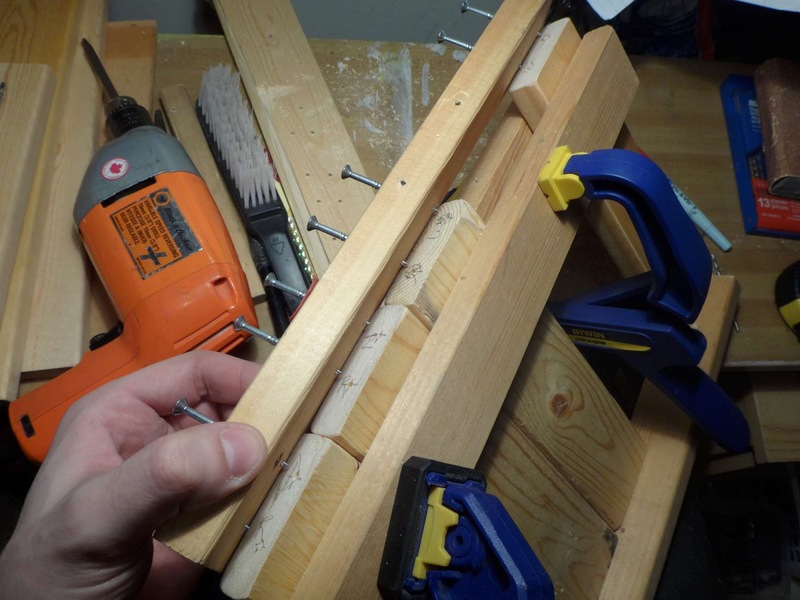 I pre-drilled this set of holes in the pieces before making the linear cut to assemble the corner bits. Unfortunately, I didn't think to have the holes for the bottom piece a bit higher. You can see how the pieces are screwed to a longer board that I can clamp down during the long cut (I had removed the top piece for this photo to show how they were both attached). After going back to verify that I hadn't finished a second one, I found the piece still there, waiting to be sliced in half. I might actually dismantle it again and pre-drill the diagonal holes for the long side pieces too before cutting it. Here are the first two bottom slats being affixed to the assembled ends. The alignment was a bit off, but nothing a little forcing can't fix. I offset the screws that attach to the corner bits so as not to conflict with the screws I'd just inserted, before I realized that I'd also need to drill holes through where these screws go for the side slats! I don't remember exactly how I addressed this (and I'm not going to empty it out now and turn it upside down), but it's not the end of the world. Here's the side view, after attaching all the bottom boards. The slat at the bottom of the picture is the top slat and I installed it first to make the ends square. It's screwed from the inside to keep the outside clean. You can see how I've pre-drilled the holes for the remaining side slats on the opposite side. These screws on the inside are exposed (albeit only if you're looking in the box) so I used brass coloured screws. 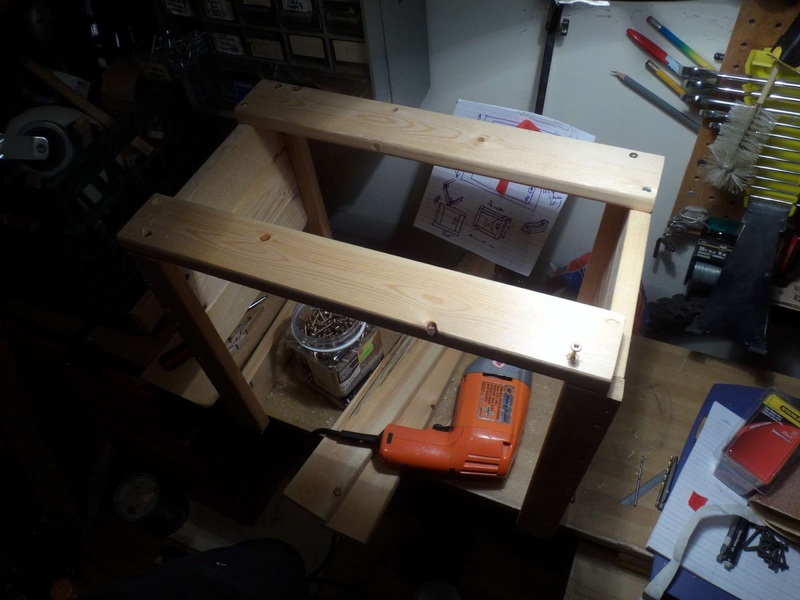 The next time I assemble one of these crates, I would not only drill the holes in the corner bits before assembling the crate, but I would drill the holes for the long side slats at an angle so it's easier to screw them on. 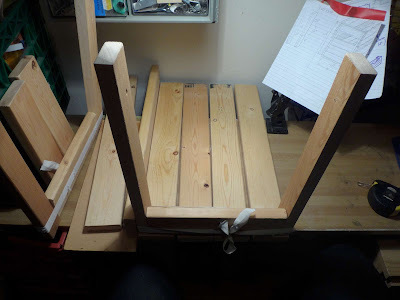 Due to a miscalculation, I hadn't cut quite enough slats for the long sides, and by the time I finished I didn't want to bother cutting any more. Three is enough to hold the crate together and the contents in. One pair of screws is visible on the corner bits, but I don't particularly care. I also ended up with two extra 9" pieces, which were useful to have around for a future project. 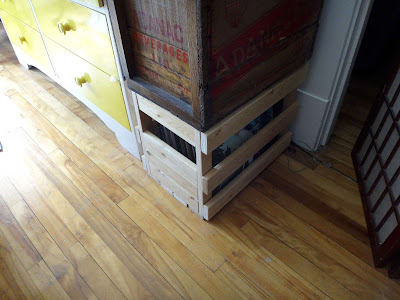 I had intended, but forgot, to have the uppermost long side slats be raised by the width of a board, so that when these crates are stacked the bottom slats of the upper one are nestled into the side slats of the one below. I can do that for the next one to go under this one. It doesn't really make a difference for stacking my antique crate on top of this one. 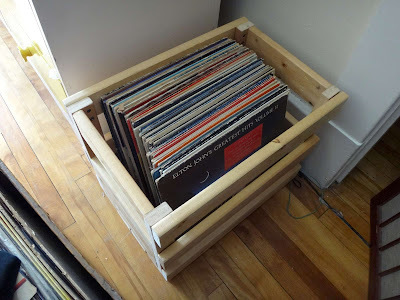 Lade boards come in different widths and lengths, so if you're not trying to match the dimensions of a preexisting crate, you can play around with the sizes. You can see here that there's lots of room in all three dimensions to play around. Since the end pieces and the long bottom/side pieces are cut from the same board, you can make the box a bit narrower in one dimension to be wider in the other. 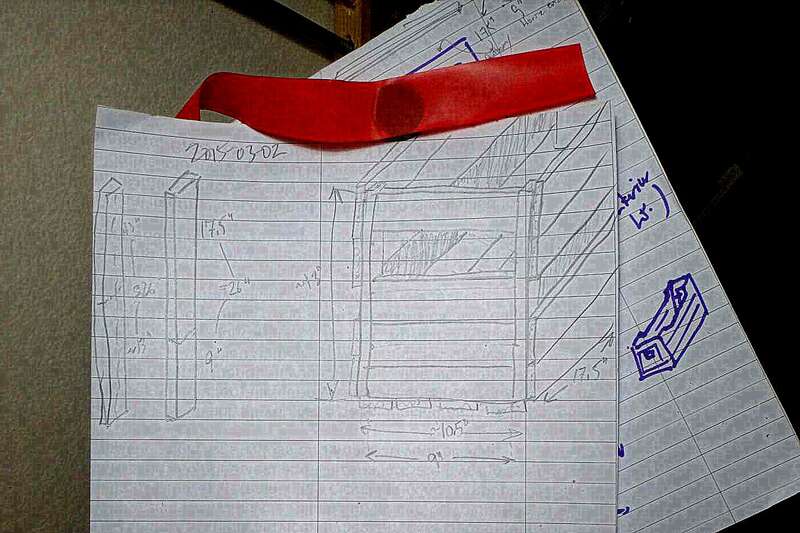 This is important for ensuring that the narrow dimension is a multiple of the width of the slats, so there are no gaps in the bottom. 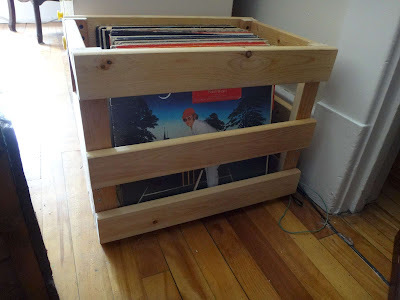 I hadn't factored that into my measurements and ended up having to put a thin board in the bottom because I had some gaps, which are a hazard when you're using the crate to carry narrow objects like record sleeves! Nevertheless, I'm really happy with how this turned out. I could paint it, but this suits me fine since the boards have already been treated by our fine friends at IKEA (a store which I hope never to have the misfortune to visit in person as long as I can still find their products secondhand at the curb). Due to the limited amount of space in my kitchen, I stack my large dinner bowls on top of my dinner plates in the cupboard in order to conserve it. My bowls are heavy ceramic ones (nice ones, sturdy... I found them on the curbside ages ago along with some matching breakfast plates), so it requires a bit of effort when I want to grab a dinner plate out of the cupboard. If all five of the bowls are clean and put away, I have to actually take them out and put them down on an available surface (itself a challenge) and then get a plate, because the bowls are too heavy to lift with one hand (there are some other logistical difficulties involving contortions and stretching that also drive this requirement). Lately, I've been toying with the idea of suspending the bowls above the plates somehow, allowing free access to the plates beneath. Unfortunately, the easy solution is off the table (or out of the cupboard). I can't simply put a table-like tray over the plates to hold the bolws, because there's not quite enough vertical clearance for that. Instead, I'll need to suspend the bowls slightly with some sort of cradle mechanism holding them from the sides, either from above or from below. This would allow just enough space for me to slide the plates underneath. How exactly this will work will take some thought. Off I went to my workshop with the pile of plates and bowls to do some figuring and measuring. On the way to the workshop (this is a trip taken on foot, I should mention, through two rooms. I don't have like a basement or giant shed full of power tools. My workshop is barely larger than a closet, and much less tidy), I stopped at the bedroom and put the plates and bowls down because I figured I should make sure there's a destination surface for them in the workshop. Once in the workshop, I saw that my workbench was covered in sawdust from the last project, and various screws, bolts, and other knick-knacks that got relegated there from other parts of the house. 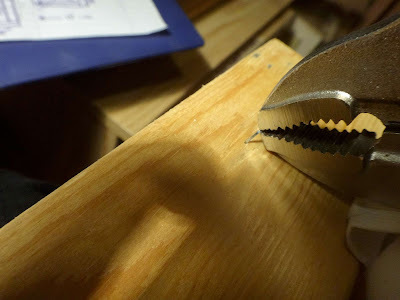 Before brushing the sawdust off the workbench, I filed away the screws and bolts into the appropriate containers, tucked the bolt cutters back into their home, and started putting the hand tools back onto the pegboard. My wire brush, however, didn't appear to have a home on the pegboard. In keeping with the mindset of the day, I figured I should make one. Usually I use coat hanger wire but I didn't have any scraps of that handy. What I did have, though, was a broken election sign metal stake, whose wire was the perfect thickness for pegboard holes, almost a quarter inch in diameter. I retrieved my bolt cutters from where I had just put them away, and cut off a chunk of wire. If you've ever bent your own pegboard hook, you'll know that the end that goes into the pegboard has two nearly 90 degree bends very close together, maybe a quarter inch apart. 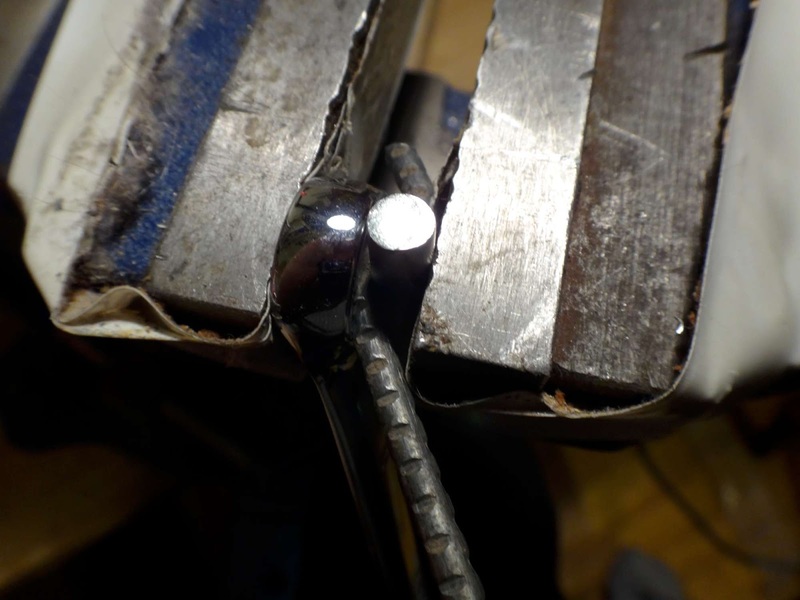 If you've worked much with wire, you'll know that a quarter inch is ridiculously hard to bend accurately at such small distances with hand tools. I knew this, but tried anyway. I was able to bend the end the tool hooks onto, but the pegboard end was stumping me. I have a wire-bending tool from Lee Valley, but the part of the wire I needed to grab on to was still to short. I thought maybe it would work if I hammered a flathead screwdriver onto the wire with two things on either side of it, but that just resulted in other stuff jumping off my workbench from the hammering. I'd need a stronger tool. Hey, I've got a vise! I'll use that. I got my vise out of its hiding spot, pushed aside anything I hadn't yet tidied off the workbench and swept away the sawdust to have a clean surface on which to put the vise. My first choice of things to clamp the wire into was the cavity on my Lineman's pliers, the one opposite the space where the wire cutters are. But that just pushed the wrench open. Also it was too big. I realized that my combination wrenches have a circular opening at one end and I had a variety of sizes to choose from. Using one of the pegs from the wire-bending set, I stuck the wire, the wrench, and the peg into the vise, and clamped. I was worried that the crimping on the wire would cause it to snap, but it bent perfectly! 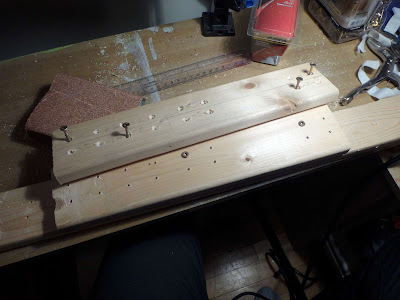 While I was at it, I made a second pegboard hook too, since I had the right equipment out. I rearranged a few of the things on my pegboard, and somehow ended up using both of the newly-made hooks for other things. So I put the wire brush on a hook that was probably available before I started with all the wire-bending. Never mind, that was done, I could continue with tidying the workbench to start working on the bowl thing. Oh, but the vise! 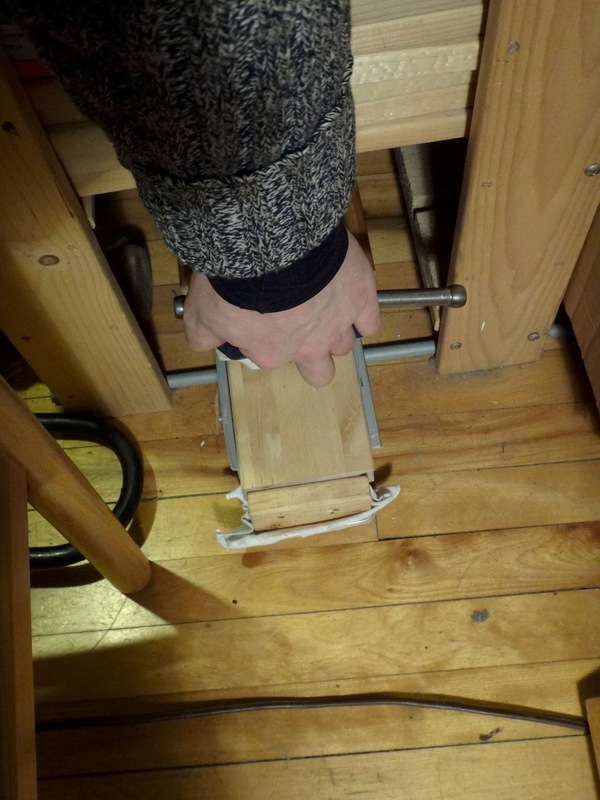 I keep the vise on the floor, under a shelving unit in a particular gap that isn't useful for much anything else than storing a vise. (In a proper workshop, I'd keep it mounted to the workbench) But vises being heavy, it's a struggle to push it underneath there, particularly without scratching the hardwood floor. 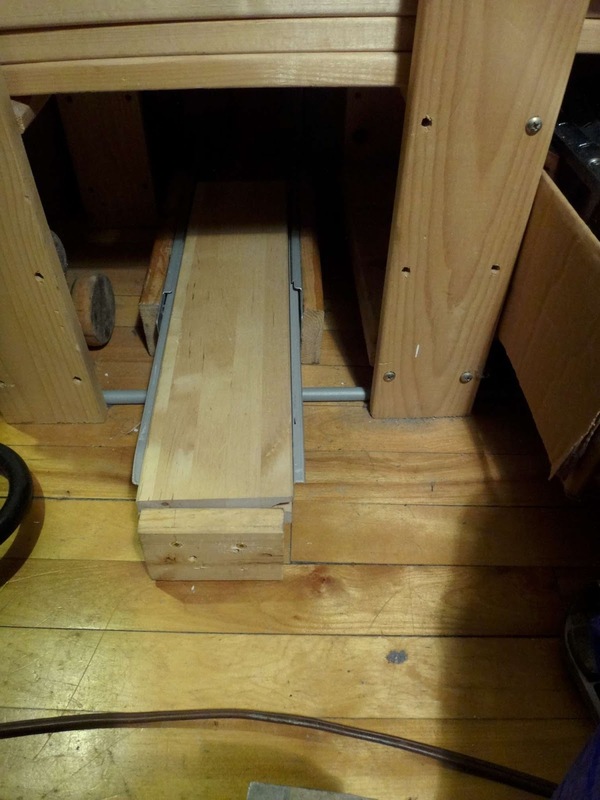 I'd been thinking for a while about some sort of trolley mechanism to allow me to slide it in and out from under the gap so I would only have to lift it vertically. I went into my box of miscellaneous bits of furniture to find some rails and trays. The only flat style tray (which you mount sandwiched between the two flat surfaces) was a full-extension drawer mechanism, which I'd rather save for something else. But I did have the rails salvaged from a keyboard tray. Wrapped around the rails was a baggie with the four recessed mounting screws that came off whatever piece of curbside furniture I scrounged it from. Good foresight on my part, if I say so myself. I found two boards of roughly similar size to try to mock it up on as a proof of concept. I didn't want to go to all the trouble of building the thing (and putting holes in the boards) if it wasn't going to function well. The thing with keyboard trays, though, is that they aren't well suited to mocking up. They are mounted to the bottom of the moving part, and the stationary parts are mounted to the sides of the enclosed area, so I can't simply put the board on top of the rails and see how well it slides, because the bottom of the board is lower than the rails and rubs on the table. Not only that, but only one of the sides has an enclosed channel; the left side rail can come straight out (presumably to make it easier to install and adjust). I found some short screws and hastily screwed the rails onto the moving board, without even bothering to drill holes for them. This wasn't enough; the channels also have to be mounted to something so the moving board can be suspended from it. I disassembled a set of blocks I had built for some other purpose that didn't work anymore to get two short boards from it and I screwed the channels onto them. Still, though, I couldn't mock it up. I tried resting the two sides on the workbench and installing the moving board between them. I had to hold the sides together to keep the thing from falling off, but when I did that I squeezed it and couldn't tell if it was running smoothly. I managed to find a piece of hardwood (scavenged from a 1970's government-issue wooden desk that my landlord left on the curb) which was the perfect width for the job, and with some metal L brackets and screws (also a curbside find), attached the sides to the hardwood bottom. Bending the L brackets slightly allowed me to 'fine tune' the adjustment of the rails, and it worked great! Okay, so much for the mockup, but I realized that in trying to mock it up to see if the mechanism worked, I had actually built the thing. Unfortunately, I had not carefully considered the relative arrangement of the top and bottom pieces in so doing. They lined up nicely. Too nicely. 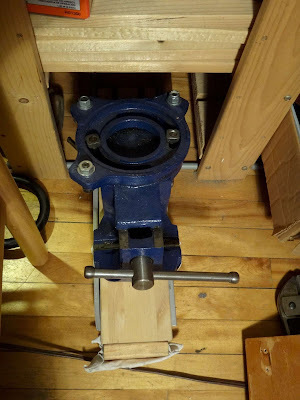 My initial design had a support sticking out from the front end of the top piece so that the whole mechanism doesn't just tip over when fully extended with a heavy vise on top of it. 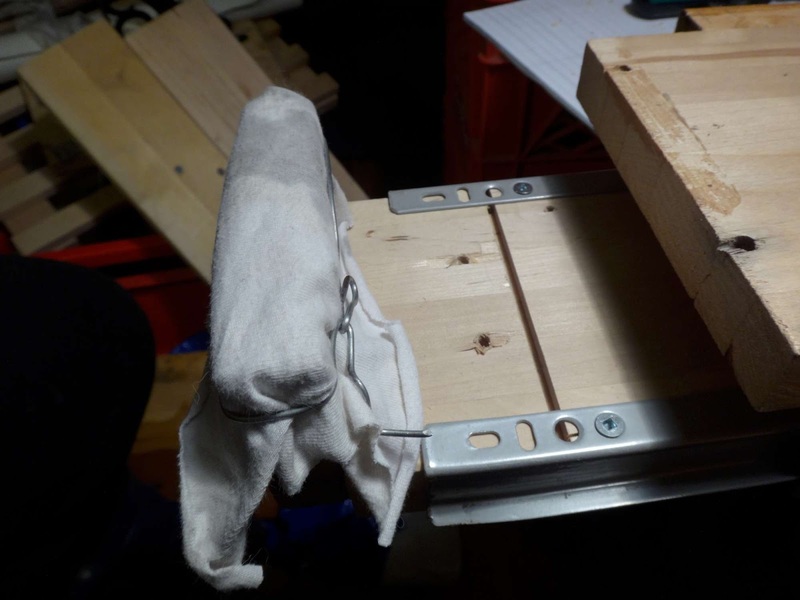 You'll note, however, that the top surface of the board is lower than the non-sliding channels, and the vise is wider than the top board. 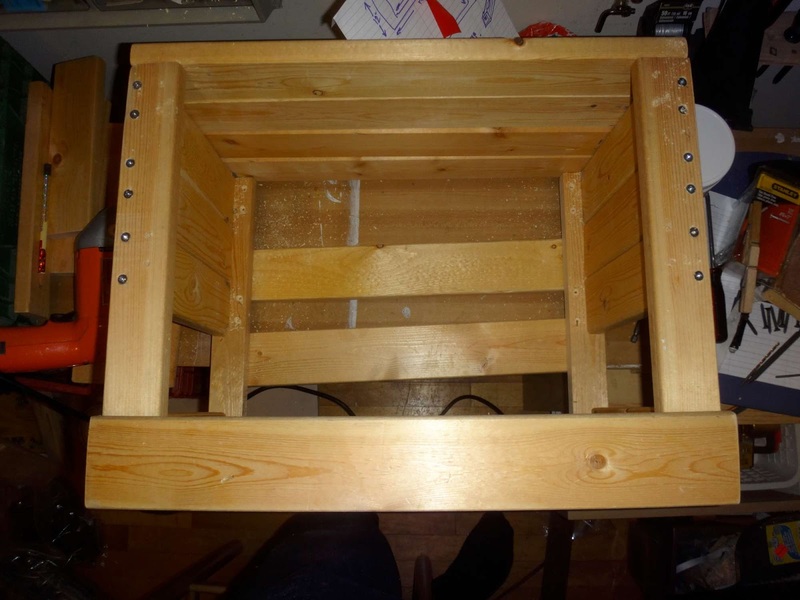 Luckily, the top board was scavenged from a discarded BEKVÄM kitchen cart, which, despite the one broken part on the one I found on the curb and disassembled for parts, has great birch components. More luckily, the BEKVÄM has two identical panels of this size. Without even screwing it on, I just rested the second piece on top and that worked perfectly. The top of the moving board was now higher than the non-moving parts. All that was left was to put some felt padding on the base of the end that sticks out, so it doesn't scratch the floor. Not wanting to go to the trouble of getting my felt from my crafts bin in the closet (or, more specifically, having to put it away afterward) or figure out what kind of glue I'd need to adhere it to the wood (although in retrospect I think I have some self-adhesive furniture-bottom felt padding in my workbench drawer...), I instead used a scrap of old t-shirt cloth that I'd been using as a rag. And final testing... just enough clearance. Works great! I thought about putting some sort of handle on the device to give me something to grab a hold of. I considered the four remaining loops from the bracket used in my bicycle handlebar clipboard mount, but couldn't think of a quick and easy way to attach it that didn't involve drilling (since it was now just past 10pm). As it happens, the problem solved itself because I discovered that the vise happens to make for its own handle. Not bad, eh, for a contraption built without having to saw any wood and using only previously-scavenged items that I had lying around in my workshop? Finally, with the vise tray built, I could start working on the plate thing! What was that again? I put the stack of plates and bowls on the workbench, stared at it for a while, held some boards up next to it in various orientations, took a couple of measurements, made a rough sketch, and then put the dishes back in the kitchen cupboard. I no longer have the energy to do that tonight. Maybe some other time when I'm trying to do some other project I can let myself get sidetracked into building the bowl cradle instead.